A metaphor! We have a metaphor for this campaign. Hold it tightly. Treasure it. For there is precious little on offer elsewhere. The Australian has revealed that Labor’s $37 billion sop to the education unions, sorry, “investment in our children’s future”, will indeed deliver the 2.8% boost to GDP shadow treasurer Chris Bowen promises OECD research shows it can provide – but not until 2095. Similarly, we still have seven-and-bit weeks – 51 days – to wait until this campaign is over (although, with the way the polls are at the moment, no one can promise a firm result). Which makes it all a bit boring. The ever ebullient folk at Twitter have been pushing their product mercilessly ever since Malcolm Turnbull drove out Yarralumla’s gates on Sunday, offering a daily selection of its most noteworthy moments (in their eyes, anyway). 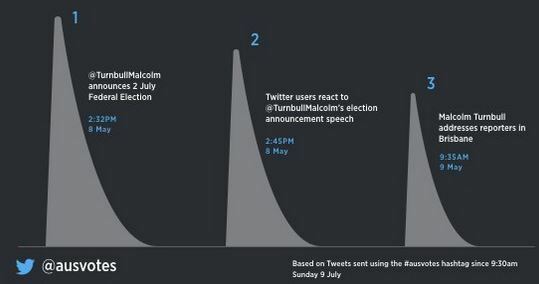 They’ve also been kind enough to provide a chart of the three most tweeted moments of the campaign so far, based on appearances per minute of the #ausvotes hashtag. It’s an interesting little graphic (left) – graphic, as one couldn’t call it a graph. While it has an X and Y axis there’s no clear units of measurement. All we can go by is the size of the peaks in ther illustration, and they suggest interest in the campaign collapsed somewhere between a quarter and third in the 19 hours that elapsed from the calling of the poll – most-tweeted moment number one – and the Prime Minister’s first appearance on the campaign trail in Queensland on Monday morning – moment number three. If the noisy and narky band of obsessive compulsives who comprise the Twitterati are responding this way, what hope is there for keeping the rest of us engaged? True, there’s a leaders’ forum on Friday evening in Western Sydney – in Windsor for once, too, instead of Penrith, just for a bit of variety. But with both the PM and Bill Shorten conserving their ammunition until the final stages of their offensives the most we can expect is a few firecrackers flung around the stage. Fortunately the Fairfax press has recognised that this campaign is already deathly dull. So they’ve helpfully decided to report something else and decreed that the end of the world is nigh. “The point of no return is just days away,” the headline reads. “Within the next couple of weeks, a remote part of north-western Tasmania is likely to grab headlines around the world as a major climate change marker is passed,” environment reporter Peter Hannam writes today (it was so much more entertaining when he was the “carbon economy editor”). There. That will heat things up. Let’s face it more CO2 will greatly improve the world as it promotes plants, which means more food, which means … what is there not to like? 2 degrees warmer? Bring it on as this will greatly improve the world as it promotes plants, which means more food, which means … what is there not to like? Global warming is happening on a small scale, but thanks to the improvements in our education standards by injecting $xxBn’s we do not have (the New Economics of Envy) our climate pseudo-scientists are able to prove via the new arithmetic that 2+2 = 4 in the present and future) as mandated by the alarmists and the our political sheep (as it is taxable). Maybe I am just being contrarian, but I wish the warming would hurry up and happen for real. Apparently using symbols deletes that section of the comment, so here it is again! Global warming is happening on a small scale, but thanks to the improvements in our education standards by injecting $xxBn’s we do not have (the New Economics of Envy) our climate pseudo-scientists are able to prove via the new arithmetic that 2+2 = less than 4 (in the past and greater than 4 in the present and future) as mandated by the alarmists and the our political sheep (as it is taxable). en passant: Each redraft looks the same to me as the one before it. I suggest you get an HTML guide book and use that to get it right. Otherwise, just leave it as it is, lest it get worse. 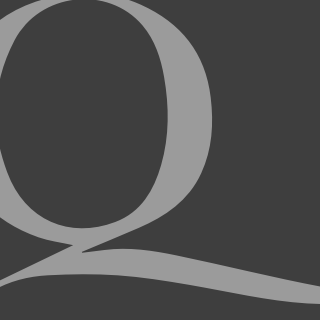 “I have just reread my entry in Quadrant Online and it is a great example of why one should not post a comment when the blood is boiling (probably because of global warming). Guggenheim refused to take a place in a lifeboat – but it was his wife who fell into the MacDongallism trap and refused to go without him. When the Titanic sank, Guggenheim floated to the surface and approached a lifeboat – who refused to take him as they were ‘full’, so without complaint he swam away to certain death – a victim of the honour trap. Stupid fellow! He could easily have bought a place and lived for a few more years. In my haste to post I missed the obvious anti-hero MacGonagle probably admires most: that gold medal performance surely goes to the Captain of the cruise ship, the Concordia. Not only did he not fall into the ‘honour trap’, but he lead the way to the lifeboats! What a man! Let us set aside those stupid Nelsons, Drakes, the many Captains who went down with their ships and the sacrifice of the tiny ‘Glow worm’ that sailed straight at the mighty Scharnhorst to distract her and let the convoy it was protecting escape its guns. I read that story in Primary School and it inspired me, but that was long before the Concordia sank. No, children should be taught to recognise and avoid the ‘honour trap’ and the follow the ‘MacGoogle’ example of Captain Coward of the Concordia. There is a previous comment that I need not quote here. If BS gets to be PM, with or without GREEN help, and starts to ‘save the world’ by taxing energy/wealth creation, then I am prepared to volunteer to give up my self funded retirement in order to seek employment in his new ‘world saving’ government. It would be for a role that is at least as important as that of being a ‘climate commissioner’. Climate Commissioners are/were only tasked with stopping the world from ‘frying’ in the future. As that task might take two centuries or more to know if he/she/they have been successful, all the Climate Commissioners have been, and in the future must be, very well rewarded. It should be at least at the level that Tim Flannery was once remunerated, [i.e. $180,000+ p.a. in 2007 dollars for ‘working’ 3 days a week]. For a far more modest fee, say $2,000 per week [in 2016 dollars] and for working 7 days a week, I would offer my services as ‘Commissioner for Sunshine’. In this role my success wouldn’t take centuries to know if I have succeeded or failed, because if I failed just once, i.e. the sun failed to rise, then I would be prepared to NOT accept my modest wage. Yes, I am a Utopian too. One day, there will be peace in all the world, free beer in all the pubs, and everyone will be paid according to their individual contribution to their nation’s welfare. I take it that “…. the level that Tim Flannery was once remunerated, i.e. $180,000+ p.a. in 2007 dollars for ‘working’ 3 days a week….” is correct. But it is an argument for a federal incomes policy: not likely to go down well with those who believe themselves to be entitled to incomes ranging from the merely outrageous to brazen daylight robbery: eg CEOs on something like 370x average weekly earnings. Which incomes are rising exponentially due to built-in positive feedback loops, and which nobody in government apparently has the slightest interest in altering. You are a most frustrating person, a chimera. You never finalise anything but just move on from one fantasy to the next. It us a waste of time pointing out to you that I have two photos taken on the same spot at the same beach 55 years apart and I cannot see any change. According to you the water should be lapping at least 1.65cm higher and we should all be heading for the hills. I have added a reply that indicates why you should be ignored (but never banned from commenting).